DREAMers and Allies: You are not alone! Continue to fight and push for a legislative alternative. Congress must pass the bi-partisan DREAM Act to protect these hardworking young people. Click on the link below to call your member of congress and urge them to take action! 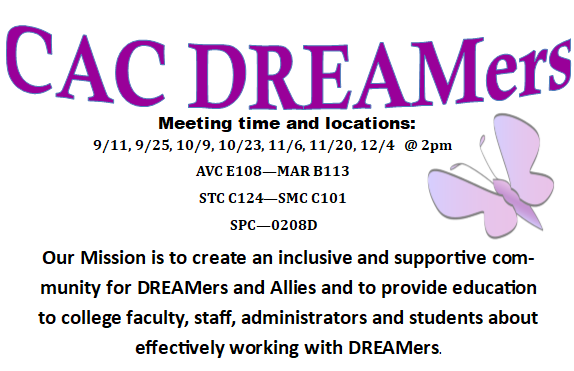 The CAC DREAMers Club will provide academic and social support and scholarship information to CAC students with Deferred Action for Childhood Arrivals (DACA) work permits and undocumented students. The DREAM ACT (Development, Relief, and Education for Alien Minors Act) has never been enacted. Immigrant youth brought to the US as children currently have no pathway to citizenship. •The DREAM Act has never been enacted. Immigrant youth brought to the United States as children currently have no pathway to citizenship. •Deferred Action for Childhood Arrivals (DACA) provides undocumented youth temporary reprieve from deportation- granting DACA can be revoked at any time. •DREAMers and DACAmented students do NOT have access to comprehensive or Federal financial aid. •Approximately 65,000 undocumented students graduate from United States high schools annually. NOTE: FALL 2017 meetings have been cancelled for the rest of the semester.